Mark de Mori is a 6'2 233 lb. rising heavyweight contender. Nicknamed "The Dominator", Mark resides in Perth, Western Australia and has a record of 16 wins, 1 loss, 2 draws and 14 KO's. He recently signed a contract with Don King Productions and will be fighting in the United States again in the near future. Mark was gracious enough to take some time out of his busy schedule to do an interview. Q: You recently signed a 3 year deal with Don King Productions. Don King is perhaps the world’s most known promoter. How does it feel to know that he sees you as a potential star in the heavyweight division? A: I have been with King for almost three years. Having him backing me is almost surreal coming from a place like Perth, Western Australia. My manager Ted Allen and I are looking for big fights. We are hoping to secure a fight with a big heavyweight name as soon as possible. This year has been frustrating with some proposed big fights coming apart at the seams at the last minute. Q: Some fight fans may not have heard of you in the United States yet. Do you have a message for them? A: Watch and see. I see a lot of talking happening with most fighters. I’m just interested in proving what I can do by testing my abilities against highly regarded fighters. I want the tests because I do the hard work. If you are sick of seeing fat, lazy heavyweights then I will be a breath of fresh air. Q: Sometimes the media criticizes the current state of the heavyweight division because of the depth it had in the 60’s and 70’s with Ali, Frazier, Foreman, Liston, Lyle, Norton, Quarry, Ellis, Patterson, Bonavena, Mildenberger.....and the list goes on. What are your thoughts about the present era of heavyweight fighters? A: The Klitschko’s are very good fighters. Maybe if they were American, the Western media would be celebrating the heavyweight division?It is also hard to compare the action of past heavyweights as many past heavyweights would have been cruiserweights today. The division needs some new blood, but I think for the next ten years the Eastern Europeans will be leading the way. Q: Both Wladimir and Vitali Klitschko are on top of their game right now. I was at Madison Square Garden when Calvin Brock fought Wladimir Klitschko. At times, Brock was successful when he went to the body. If you got the opportunity to fight either Wladimir or Vitali, what would your strategy be? A: They are both different fighters and there is not much you can do they haven’t seen before. I think to beat the best you need more than tactics. You need an unshakable will and desire to win at all costs. Most of their challengers have seemed happy to get paid and last as long as possible. Q: Who would you like to fight right now and why? A: Evander Holyfield or James Toney as they are two of my boxing inspirations. To be honest, I really don’t care as long as they are highly regarded I will be interested and motivated. Q: What are some of the things you are working on in the gym now to prepare for your next fight? A: I watch boxing every day and try to find new things to add to my arsenal. I get bored if I don’t have new things to work on. I have been told I will fight a top ranked heavyweight by the end of the year, so now I am just focusing on getting in fight shape asap. I am hearing December 18 as my next fight in St. Louis. Q: When can fight fans expect to see you fight in the United States again? A: If all goes to plan, by the end of 2009 in St.Louis again. They didn’t like me last time I fought there, so I look forward to the same hostile reception in December. Q: How many times would you like to fight in 2010? A: I want quality not quantity. I’d rather have one big fight than 10 pointless fights. It’s time to see how I do against top fighters. Anything else will feel like I’m treading water. Q: The earliest fight I remember watching was “Sugar” Ray Leonard defeating Donny Lalonde. Then, I saw Mike Tyson knockout Frank Bruno in their first fight and I became an avid boxing fan. What was the first boxing match you saw? A: The first fight that really made me a fan was when Tyson and Bruno fought for the second time. Mike Tyson is the reason I started following boxing. Watching him destroy competition with ease like he was some sort of immortal gladiator, but then he ran into a fearless Evander Holyfield! Q: When you were growing up, who were your favorite fighters to watch? What characteristics have you taken from them? A: Mike Tyson for a long time and in the last few years James Toney, Pernell Whitaker and Floyd Mayweather have been my teachers as great defensive fighters. Q: Do you try and emulate any fighter’s style? A: It depends on my opponent. I change my style depending on my opponents strengths and weaknesses. I train and teach myself, so I like to see footage of my opponent. Then, I change my style to suit the opponent. Q: What is your favorite punch to throw? A: Left hook to the body. I have knocked a few opponents out with body shots. I take so much satisfaction seeing them hurt with body shots, much more than a knockout from a head punch. Q: Do you help train any fighters in the gym in between your fights? A: I have trained fighters amateur and pro a little, but I have never had one of my fighters lose a fight. It’s not something I want to do seriously. Q: Do you have any hobbies or activities you participate in when you are not training for an upcoming bout? A: I like surfing, snorkeling and anything to do with the beach. Q: What is your biggest motivation? A: Not having to get a normal 9 to 5 boring job! Also, proving to people I can make it much further than they ever thought. Q: You suffered your first and only career loss by a knockout in the 1st round to John Wyborn on September 17, 2004. However, you followed that up with a 3rd round TKO win over Vai Toevai on February 24, 2006 in your next bout. Can you describe what your layoff from the ring was like in between those fights? How difficult was that loss for you to overcome? A: The loss was good for me. It made me look at where I was heading and to make some changes.The layoff was great because I was really sick of boxing even before my loss, just burnt out and sick of it all. I came back with more enthusiasm. Q: Who or what has been your biggest inspiration in and out of the ring? A: I just love to train and fight. I guess you can say my biggest motivation is watching people that can’t do what they love shuffle through life without a purpose. I have worked so hard that I can now do what I love and that is very rare. Q: Can you describe how fighters such as Kostya Tszyu and Jeff Fenech helped to bring more attention to up and coming fighters from Australia? A: I was not into boxing when Fenech was around, but I did watch Kostya. At the least, just having someone doing well meant boxing was mentioned because in Australia it is not one of the top sports. Q: What do you think you would be doing if you were not a fighter? A: I don’t think I'd like to know. Boxing is a good game for people with a killer instinct. It gives me a release and a focus. Without it, I don’t know what I would be doing. 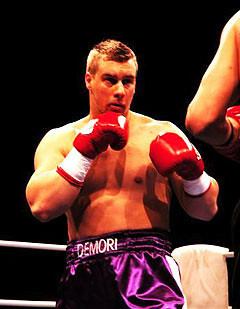 Q: Lastly, what is the one thing about Mark de Mori that the boxing world does not know that you want them to know? A: That I am willing to take on the top dogs, prove myself, always be 100% prepared and if I don’t make it, I will have no regrets. I want to thank my sponsor Alan Burns because his support has allowed me to train properly and become a totally different fighter.